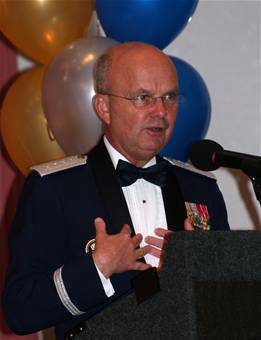 According to former NSA boss Gen. Michael Hayden, the Pentagon’s “full spectrum military cyberspace operations” are now fully integrated with NSA’s superabundant surveillance. “Now, would I keep Cyber Command at Fort Meade? Absolutely. Would I integrate the two to the best I can while respecting U.S. law? Absolutely,” said Hayden. This is not really news, of course, because the NSA already operates under the aegis of the Pentagon. The point here is that Gen. Hayden is emphasizing the fact that communications surveillance of the American public is increasingly a military affair and control and command is becoming more centralized. “Alexander was repeatedly asked about privacy and civil liberties impact of his new role, and gave answers that were, well, full of platitudes but essentially uninformative,” noted Privacy Digest. At the time, we reported that the Air Force assigned approximately 30,000 “digital troops” to “the front lines of cyber warfare,” a number representing a third of the troops in Afghanistan. “The transformation is part of the service’s larger emphasis on cyberspace operations and merging most computer system operations and network warfare functions under Space Command’s 24th Air Force, based at Lackland Air Force Base, Texas,” reported the Air Force Times on May 19, 2010. Histrionic warnings about scary cyber attacks have also provided cover for increasingly prevalent “public-private partnerships” – a neutral term for fascism — between the military and the so-called defense industry and other companies chomping at the bit to get a comfortable place at the government largess feeding trough. On Wednesday, ProPublica threw cold water on government propaganda claiming massive NSA surveillance on the American people has saved lives. “Fifty-four times this and the other program stopped and thwarted terrorist attacks both here and in Europe — saving real lives,” Rep. Mike Rogers, the chair of the House Intelligence Committee, said from the floor of the House in July in defense of post-9/11 snoop laws in direct violation of the Fourth Amendment and, by way of extension, in defense of the fascist private-public feeding frenzy in full-swing. The 54 figure is now a godsend for government propaganda as the Pentagon and intelligence community ramp up the effort to install a cutting edge tech surveillance panopticon. Gen. Alexander exploited the magic number during a speech in Las Vegas and it is used routinely in literature sent out to NSA employees. Verification is impossible because the information is classified.